‘‘They want us to do WHAT?’. Lieutenant Steele dropped into the turret of his lovely new American Sherman tank, ‘Bulldog’, before replying. ‘Orders straight from Monty. We’re to bust through the anti-tank guns and stop the counterattack. We’re the only ones he thinks are up to the task, so let’s show him how we do things!’. Muttering curses under his breath, the driver started up Bulldog and they rolled off. Moving up to the ridge, Steele started calling targets to his gunner. Bulldog rocked back as high explosive rounds flew downrange. With a terrible clang, a round ricocheted off the side of the tank. ‘Davis, blast that bugger!’, he instructed his gunner, and was rewarded by a brilliant flash as a round impacted the offending anti-tank gun. Another round impacted the tank, this time finding its mark, bringing the tank to a sudden halt. ‘Transmission’s out!’, Fraser, the tank’s driver shouted, pain obvious in his voice. ‘Alright then, time to get lucky’, the young Lieutenant thought as the breech slammed shut on the next round.Again, Davis found his mark, leaving a pile of mangled metal where the dreaded gun once stood. 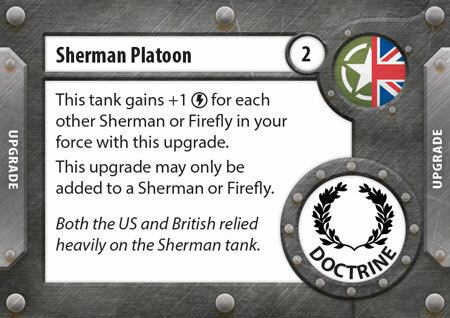 British TANKS players get to benefit from not only their own designs with the Valentine and Churchill but also tanks received from their American allies in the form of the Sherman II and Priest (RHA). 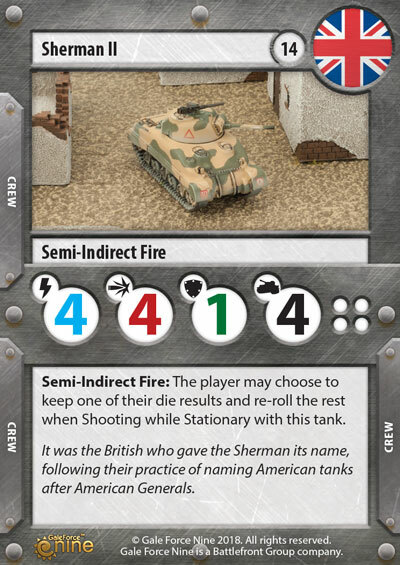 The Sherman II gives British players a cheaper alternative to the existing Sherman V and comes with the Sherman Platoon Upgrade Card allowing British players to have the same benefits as their American counterparts when they run a Sherman based force in TANKS. 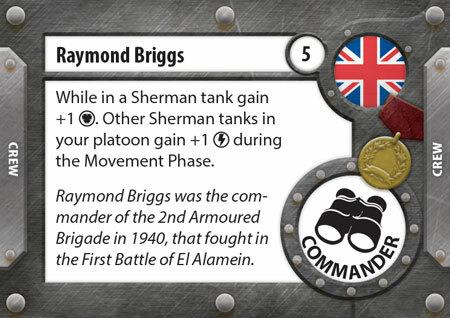 Another Upgrade card is Raymond Briggs. He is a British tank hero that costs 5 points and gives his Sherman an additional Defence dice and all other Sherman’s in his platoon Initiative +1. The Priest (RHA) gives players another Artillery option and when combined with Semi-Indirect Fire it can lay down some firepower on unsuspecting targets. 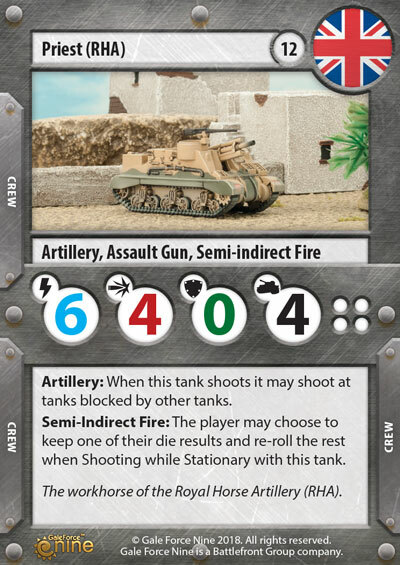 Combine this with the new Hero A. H. H. Barrow who allows his tank (and any friendly tanks within a Movement Arrow) to retain up to two dice when using Semi-Indirect Fire and you will find a Priest (RHA) battery makes a useful addition to any TANKS force.